The Tuesday tale starts early, as there are a lot of countries to get through before the day can come to an end. I err on the side of caution at the start, with no breakfast so as I can take a taxi to the airport in good time. My flights are in two parts, but all on the one aircraft. 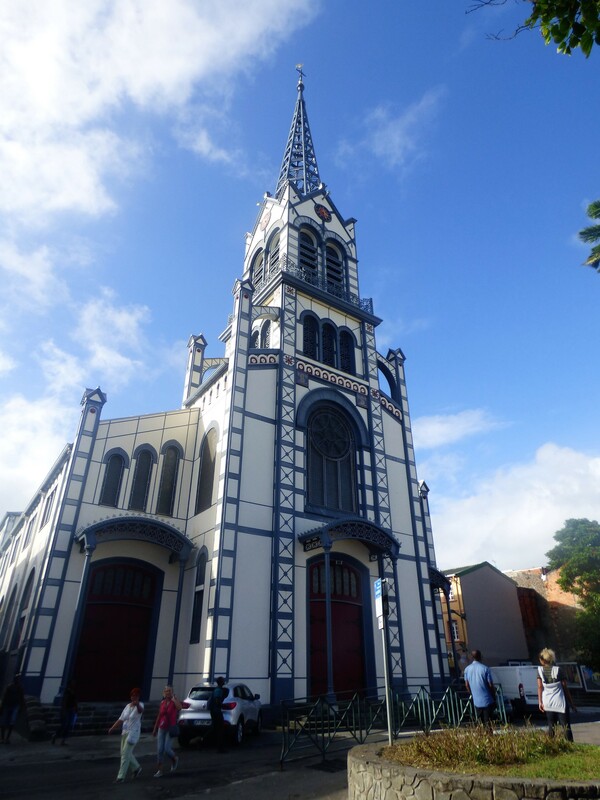 Firstly, we retrace the route from the day before, returning to Guadeloupe. Then there is a long wait in the terminal, where there is not even a coffee on sale before proceeding with a second short hop. All in all, we are not in the air for ninety minutes, but the journey takes more than three and a half hours. It turns out that of the dozen or more people waiting to re-board the flight, most have been to the same game as myself the night before. I am, however the only one whose fare has not been paid for by CONCACAF. I talk to an official who was from the offices in Miami. He will have to get off the plane again when I arrive at my destination and then get back onto the same aircraft for a slightly longer trip to Puerto Rico. Then he will change to another flight to Miami. Others, such as the referee and his assistants may need a further flight to reach their final destination. As with many of the offerings on booking sites in the Caribbean, I am not in a hotel but an apartment. My taxi driver does not recognise the address and reluctantly calls the accommodation on her own phone, literally taken directions for the full five minutes it takes us to reach the address. Now, surely it is quite simple. We have been on the phone to a person at the accommodation. But no, they do not want to come and check me in. I need three things, all of which are quickly promised. A key, a wifi password and a plug converter as they are using American style sockets. I’m in Sint Maarten, which is ruled from the Netherlands, but depends on US tourism, so USA plugs and currency rules. Lots of dollars required. It takes about half an hour for someone working in the garden to tell the lady running the apartment that the customer is in a hurry and get her down. Even then she does not appear to know where they keys are. In the meantime, the gardener says he will find me a converter plug (but cannot). Only after I have the key, and have paid for the property do they try and tell me the wifi password – and find out they have it wrong. I leave quickly, having garnered a promise (which will not be delivered on), that the plug converter and wifi password will be waiting for me upon my return. Very quickly on reaching the road, I find a bus. 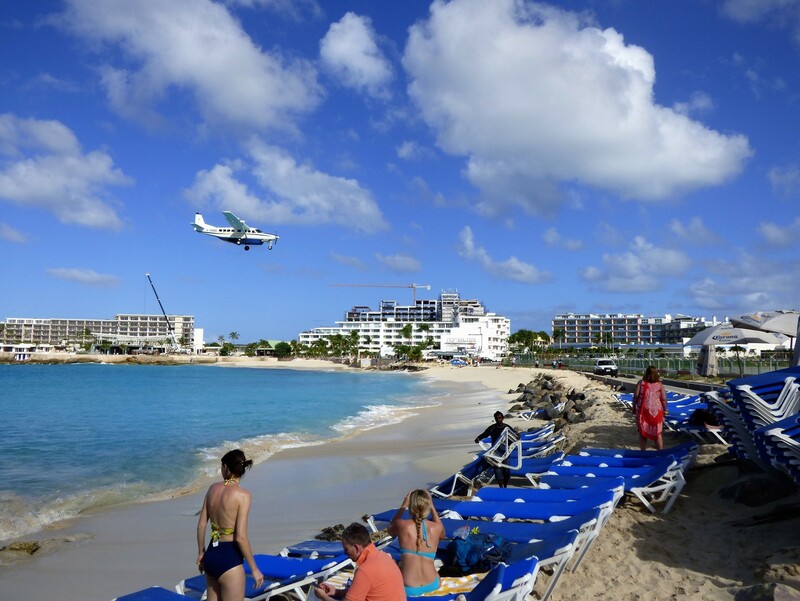 Although both are often mini-bus vehicles, it is easy to spot buses and taxis in Sint Maarten. The registration number of every bus starts with the word, BUS, followed by a number, while if the registration starts with TAXI, it is a taxi. Fares are supposedly strictly controlled, but the internet link to the fare table is broken. 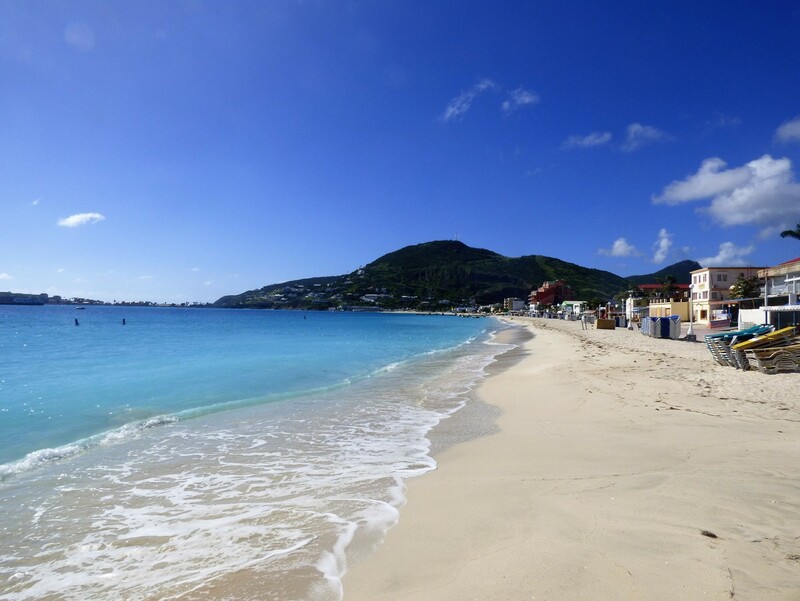 The island of Sint Maarten/Saint Martin is curious as it is split between two countries. The southern part is ruled as a constituent country of the Netherlands, while the slightly larger northern area is a collectivity of France. This means that like Guadeloupe and Martinique, it is within the EU, using the Euro as currency. It also means that on the French part of the Island, I can use my mobile phone just as I can elsewhere in the EU. This is not available on the Netherlands part. While the two sections of the island therefore have different languages, English is spoken almost everywhere. 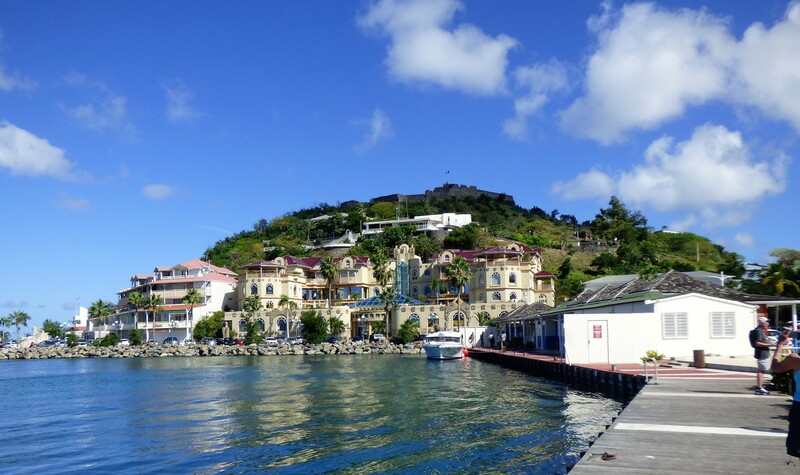 This is not at all surprising as the economy of both parts of the Island is dependent on tourism, and a very large portion of the tourists come from the USA. The whole of the Island, however was devastated by hurricane Irma, which blew through at the beginning of September 2017. 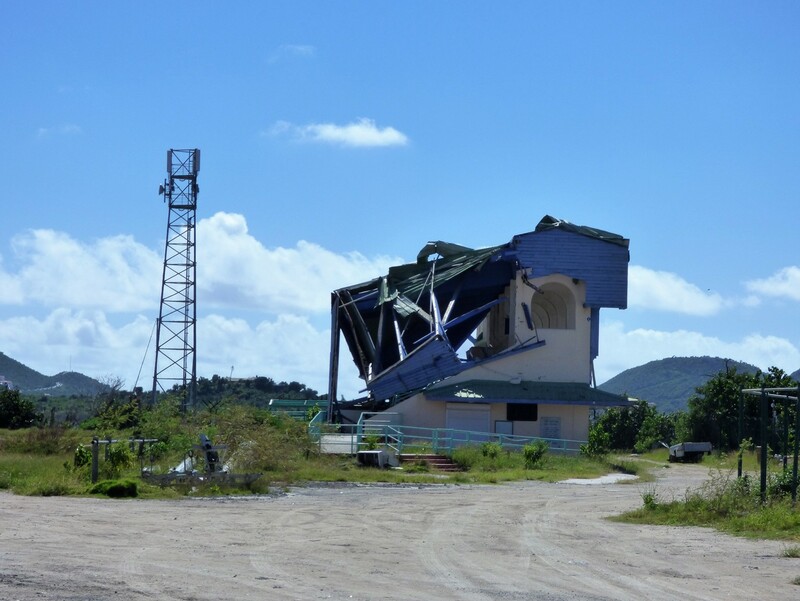 The estimates were that over 90% of structures on both sides of the island were damaged. While reconstruction has been rapid, priority was naturally in finding homes for people and getting hotels back up and running so as the economy can start to return to normal. 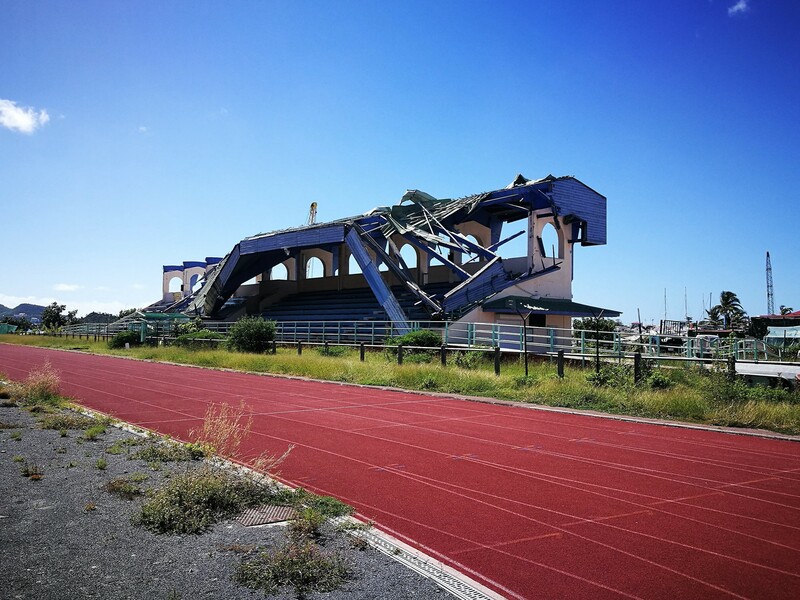 As a result, neither side of the island currently has a stadium suited to playing international football. The French side has not even restarted their league this season. 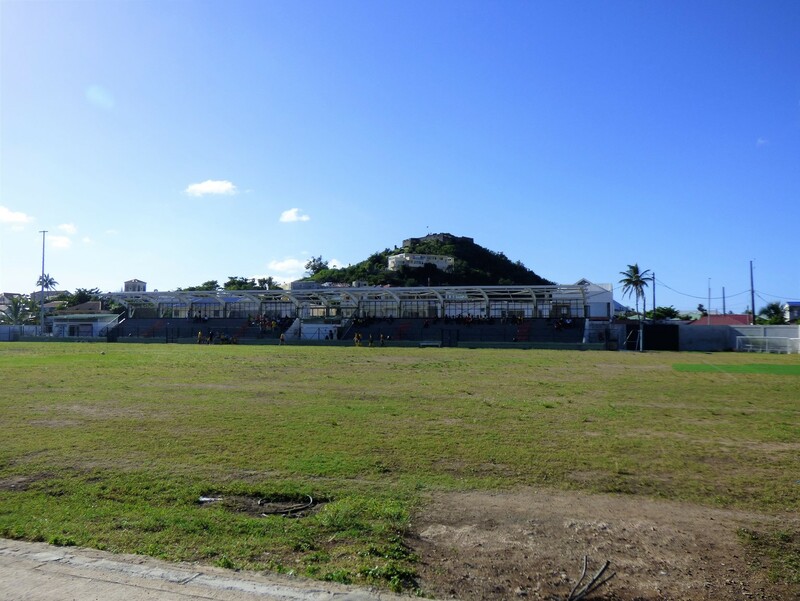 The British Overseas Territory of Anguilla also suffered badly, but the football ground was not completely destroyed, and has been re-opened with a new roof on its stand. 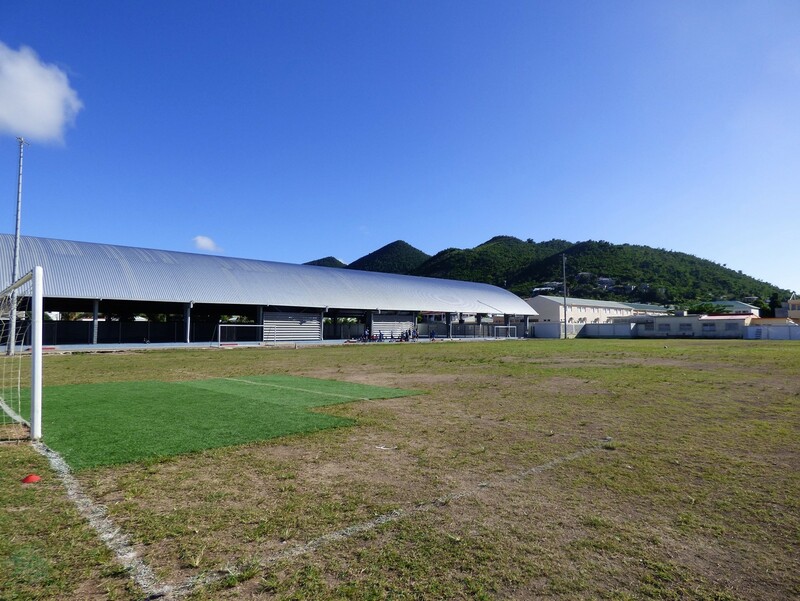 This allows it to offer facilities to both the Saint Martin and Sint Maarten teams, and also to the British Virgin Islands. 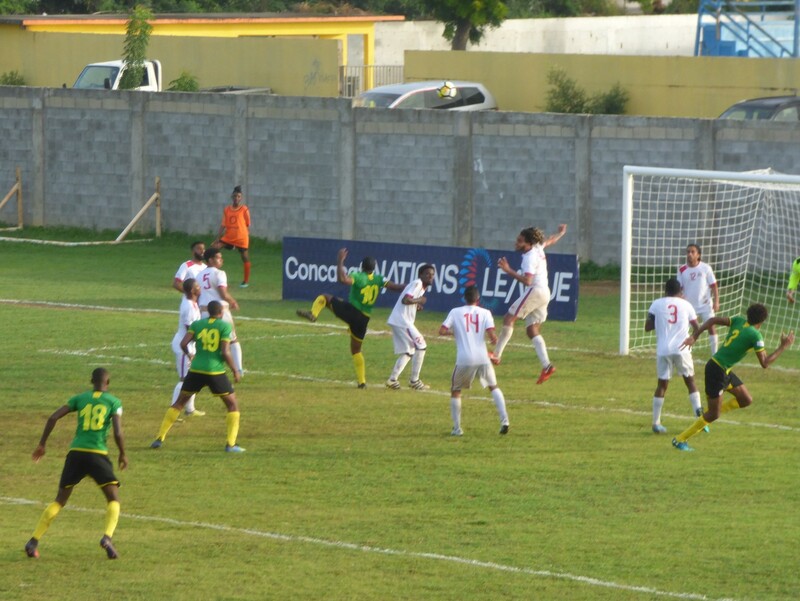 There should have been two CONCACAF nations league games over the weekend, but the British Virgin Islands game against Bonaire was postponed, apparently due to cancelled flights. Anyway, the bus takes me the two stops to the ferry terminal. 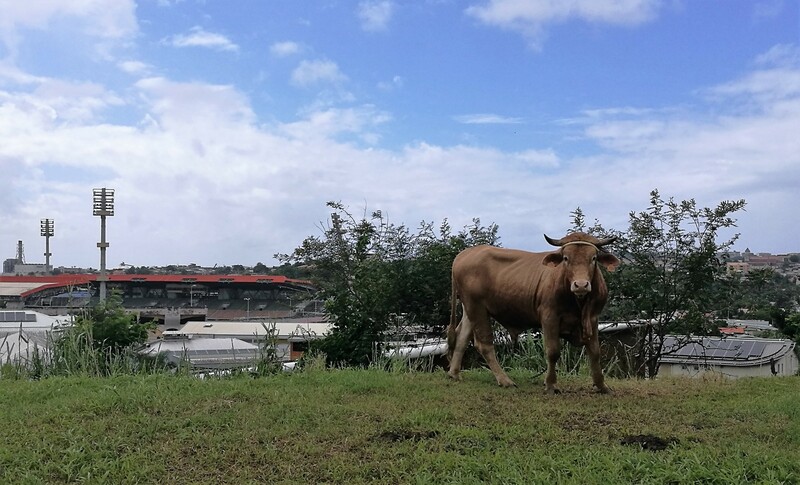 It is actually across the road from the airport entrance. I am there at the right time. At the ferry terminal there is a man selling packages for the trip to the match. This was very advantageous. 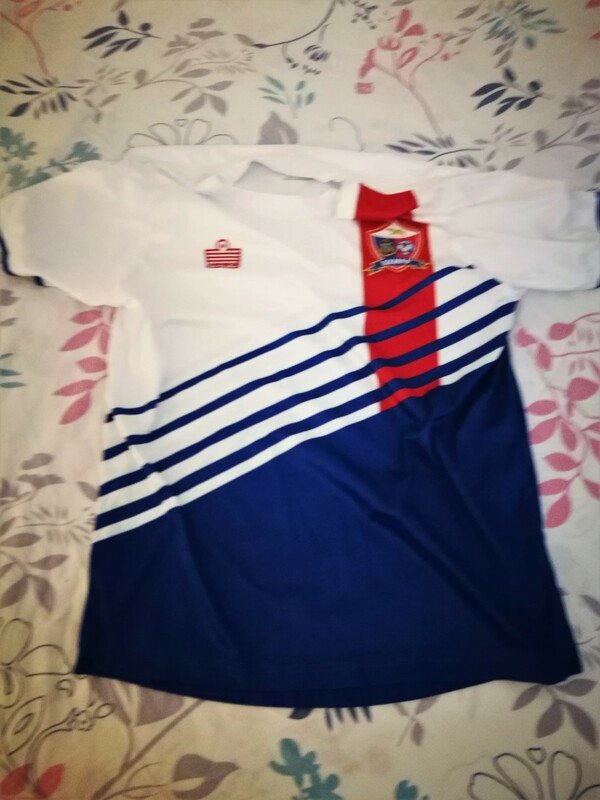 For the princely sum of US$70, the package gives me a return crossing to Anguilla, transfers between the ferry terminal and the stadium, an admission ticket for the game and a Sint Maarten Football shirt, (not in my size). Generally, the return ferry ticket could cost around $70 on its own. When I was looking into this part of the trip, I went through several stages. 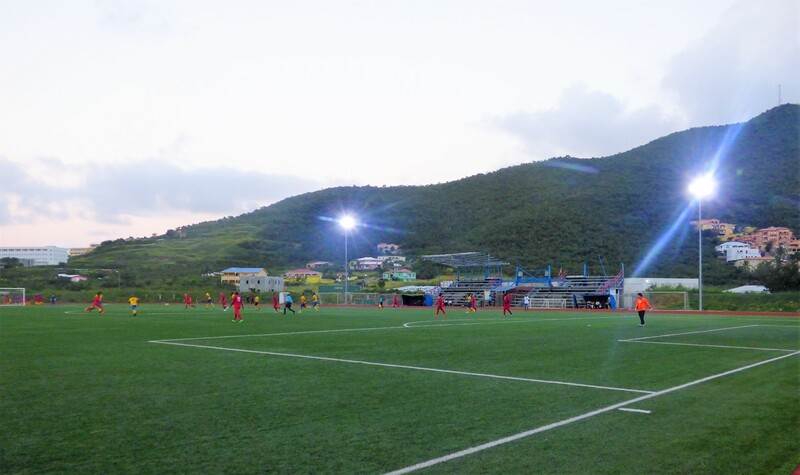 Firstly, I noticed that Sint Maarten had a game on the day, then that flight tickets were not overtly expensive, but shortly after booking the flight, I realised that the game was on the wrong island. 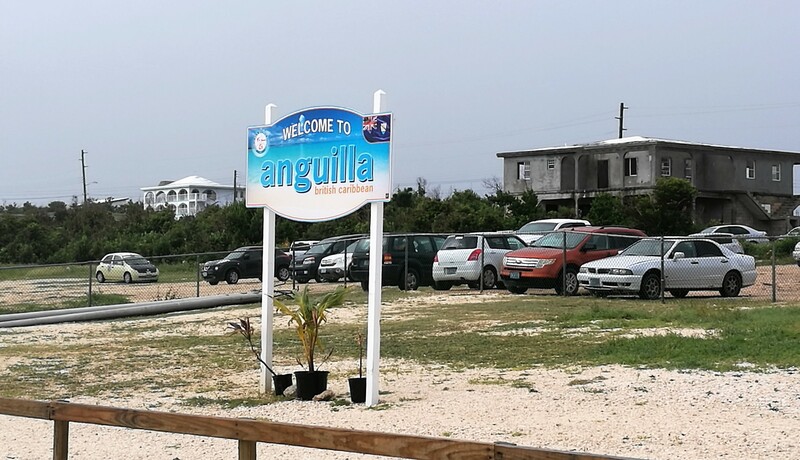 My immediate thought was whether or not I could get another flight to take me onwards to Anguilla, then when I realised this would not work, I considered giving up my (non-refundable ticket). Finally I discovered the ferry option, and realised that this would all in fact work out. 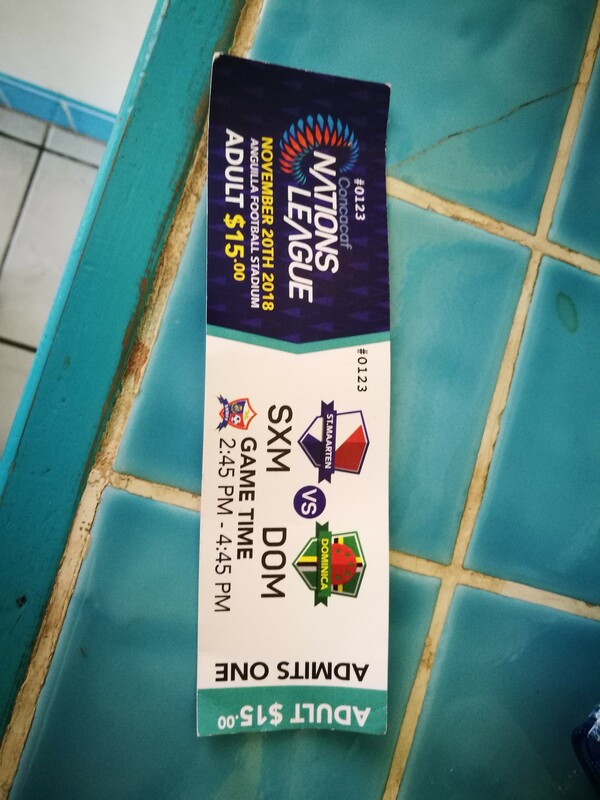 The person selling the tickets was in fact the vice president of the Sint Maarten Soccer Association. He was quick to point out Sudesh Singh, the president who was also going to be on the boat, along with his children. The terminal was busy and slightly chaotic. The check in for the ferries takes the name and passport or ID card number for every traveller, after which you are allowed to go through passport control. My exit stamp from Sint Maarten was put into the passport within two hours of arrival, and most of the time seemed to have been spent waiting at the accommodation. Most of those waiting for the ferries were match bound, giving the illusion that there could be a good crowd. It was an illusion. In reality, a pair of chartered ferries each holding no more than 34 people was about the limit. 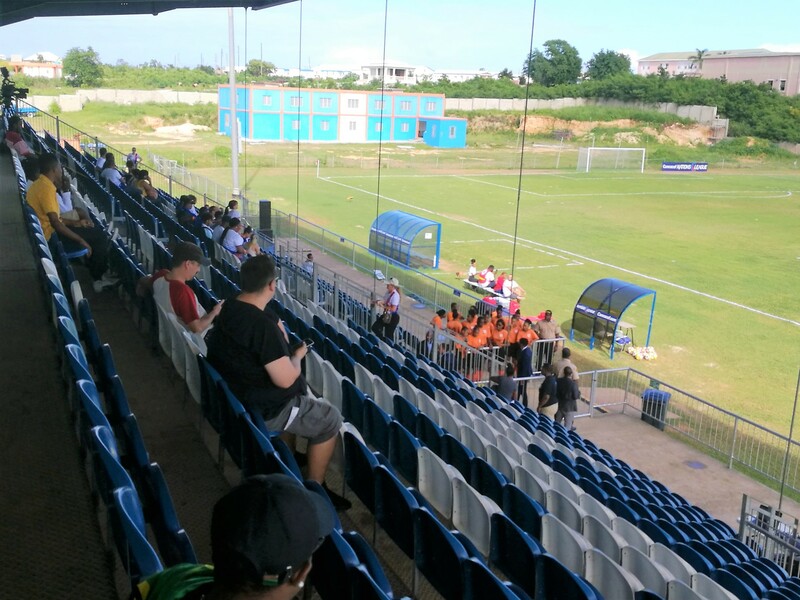 A few fans from Dominica had made their way independently, although a fan wearing a Dominica shirt who I had spoken to when getting off the flight appeared to miss the boat and wasn’t seen at the match. The atmosphere on the boat is good though. 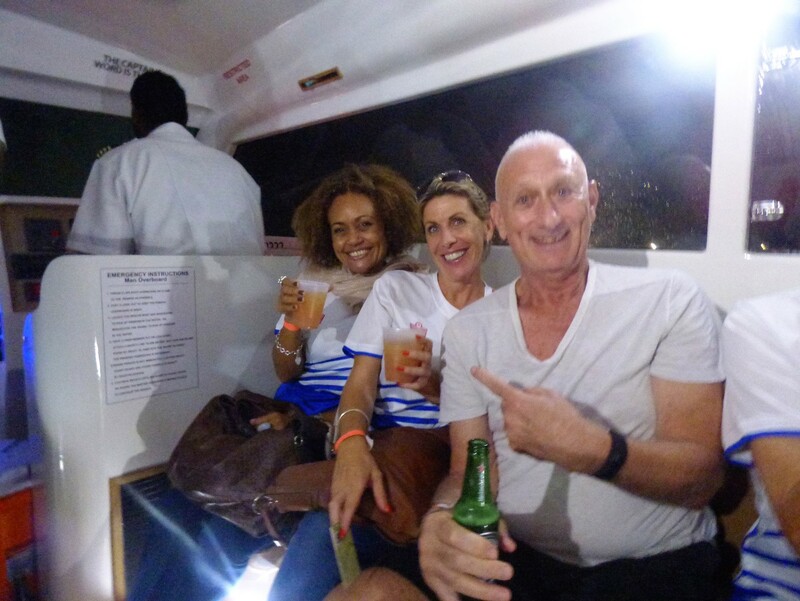 Almost everyone is wearing the shirts, and there are free drinks during the journey, with a rum punch being the favoured tipple. From the airport ferry terminal, you cross a large lagoon with the boat running quite slowly, you then go under a bridge (which is on the French side) before the captain hits the throttle and you make the speedier run between islands. I ask later and am told that the top speed is about 28 knots. It feels faster on a bumpy sea. At the other end you pass through another passport check before getting onto a minibus to complete the journey. During the slow part of the journey, signs of the hurricane were everywhere with wrecked boats everywhere. The weather has no respect for value either, so really extravagant yachts and small dinghies suffered the same treatment. 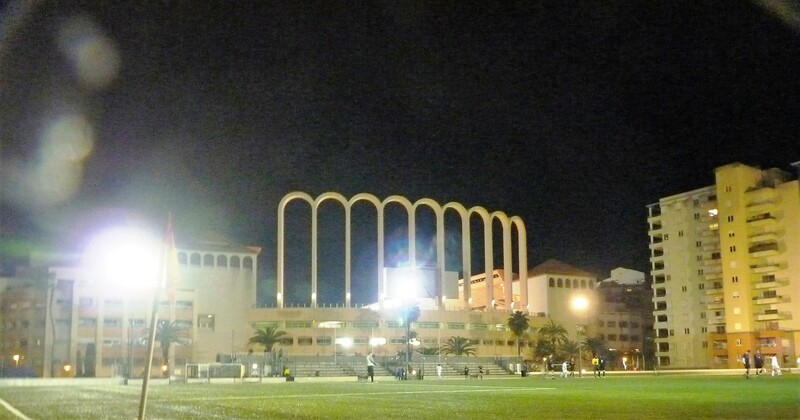 The stadium in Anguilla, the Raymond E. Guishard Technical Centre is simple enough. All the facilities are on one side and there is no access to the other three. 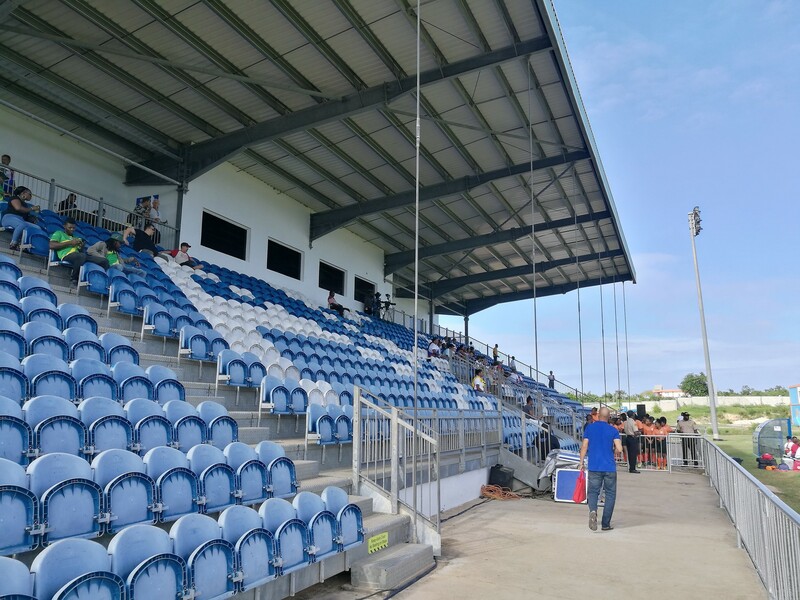 It would not past muster in the higher regions of non-League football in England, although the stand is impressive enough, standing tall with an accessway at the top where there is a snack bar and an officials and VIP room. The bar, clearly important to many of the travelling fans was situated between the entrance and the stand. If rules on drinking within site of the pitch exist in the Caribbean, then they were being ignored. The crowd was low enough that I could easily do a head count, and it came out around 80! 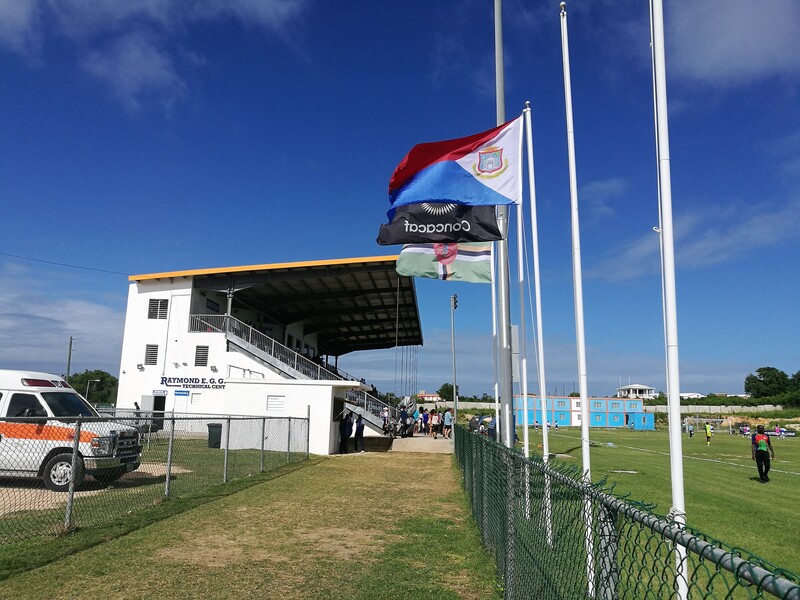 Sint Maarten started the day bottom of the table, having lost both earlier matches heavily, (no goals scored, 13 conceded in Haiti and 12 in Bermuda). Dominica themselves had only one point. Sint Maarten come through from the lowest seeing group, with Dominica one higher. Checking the players off on both sides against Soccerway suggested that only one was playing football outside his own island. This was Briel Thomas of Dominica. 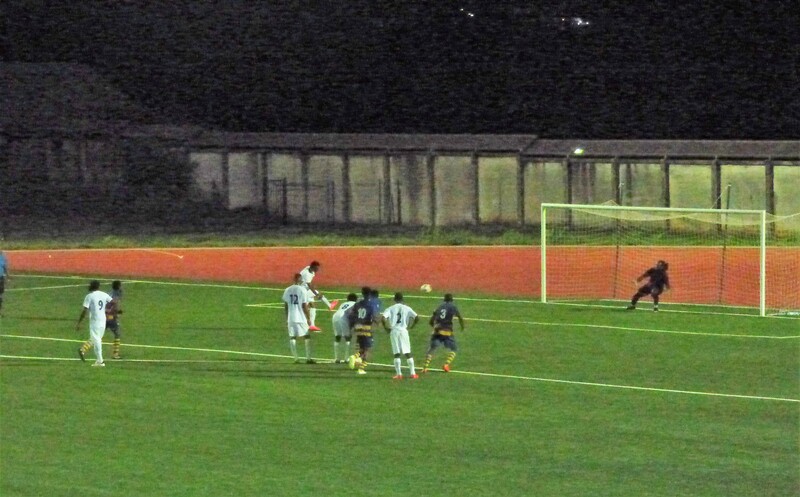 Actually, looking further suggested a couple of other Dominica players were playing in Guadeloupe. 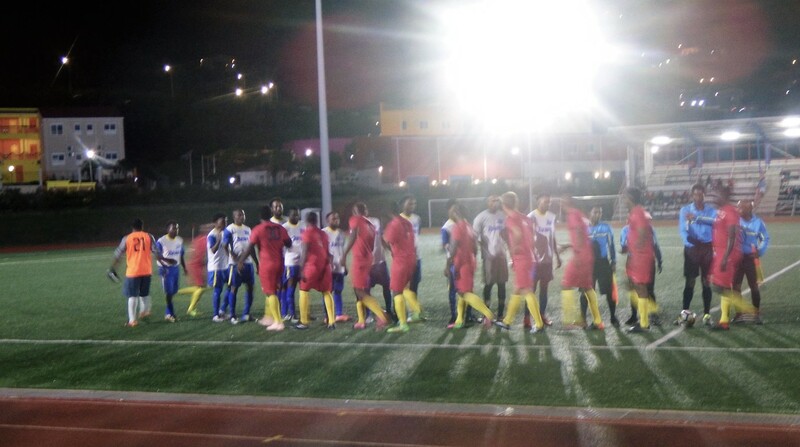 Thomas plays for W Connection in Trinidad and Tobago, and a couple of other players had played in the T&T Pro league in the past. 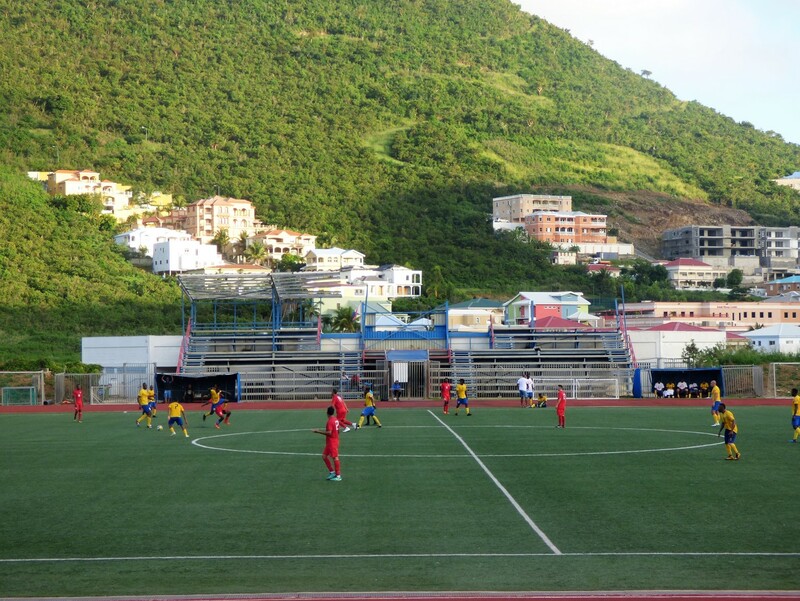 Dominica was also hit badly by the hurricane last year, and has not restarted domestic football. 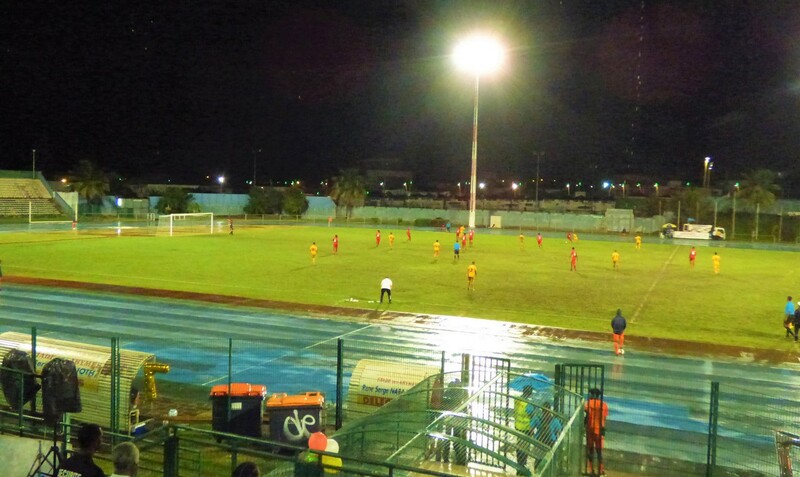 Its home game in this tournament was actually played in Guadeloupe. With so few games having been played recently by players on either side, one did not expect a classic. 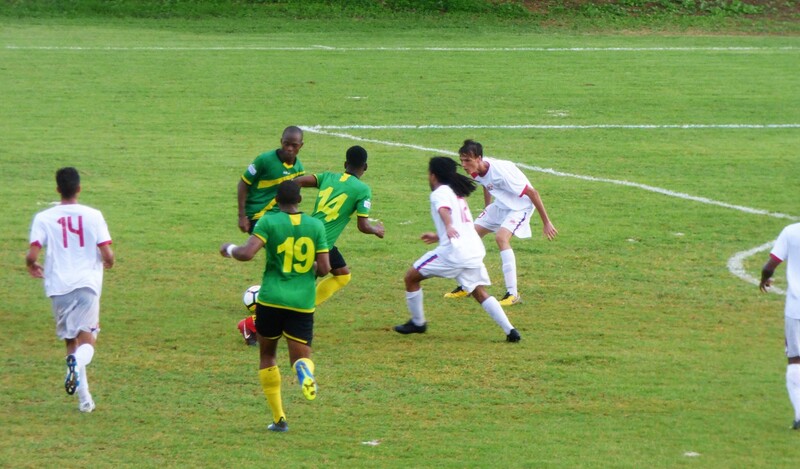 Dominica, playing a 4-3-3 formation scored early and appeared to have the measure of their opponents in the first half, even without making a second goal. Surprisingly they changed formation at half time. The coach said later this was to give them more width. Although they increased the score to 2-0 early in the second period, the change was not really a success and they run out of pace as the game went on. 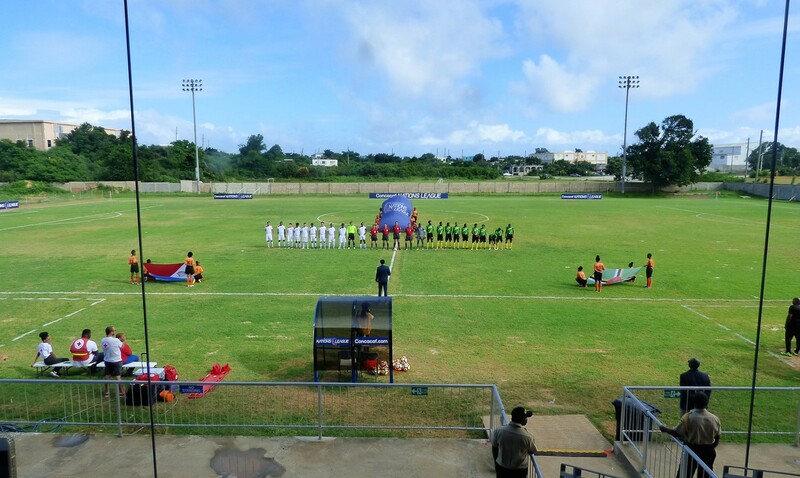 Sint Maarten were game throughout. With the two heavy defeats behind them, one might have thought they would cave in after early blows in each half, but this did not happen and they created a number of chances in the second half. In two many cases, there was not enough support for the player in possession and the chance was lost. 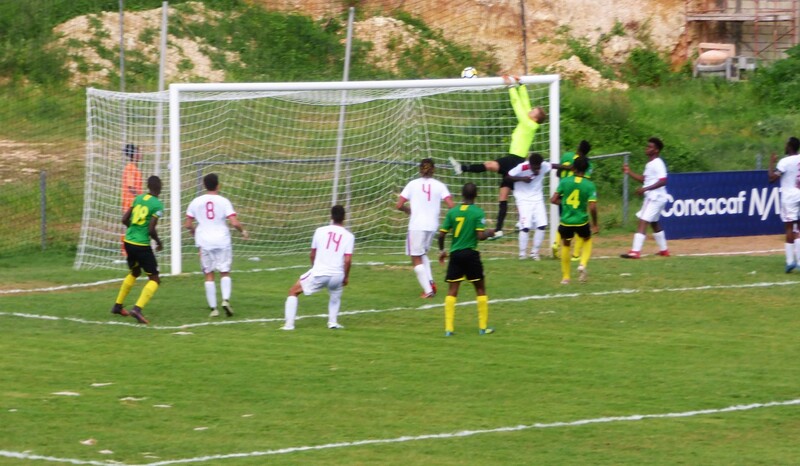 At the other end, Van Griensven, who had made a number of good saves in the first half to keep Sint Maarten in the game was relatively untested after the break, while the home defence looked far more organised against two forward players than they had done against three. One of the centre halves, Djai Essed who I was later informed is currently studying in Amsterdam could surely find a place in a fairly high level of amateur football in the Netherlands. At the end of the game, I was sought out and asked to attend to post match interviews. It turned out that the only other people there to question the officials were the match photographer and someone from the Anguilla FA. I guess these only happen here because they are contracted by CONCACAF. I have only been paid for a match report once, by the press association under their contract to report AFC games. At that time, I was told later that I reported too much on the match and not enough on quotes from the coaches afterwards. At least now I know that these conferences tend to start with a request for the coach’s thoughts on the game. We got a little information that neither coach was unhappy. 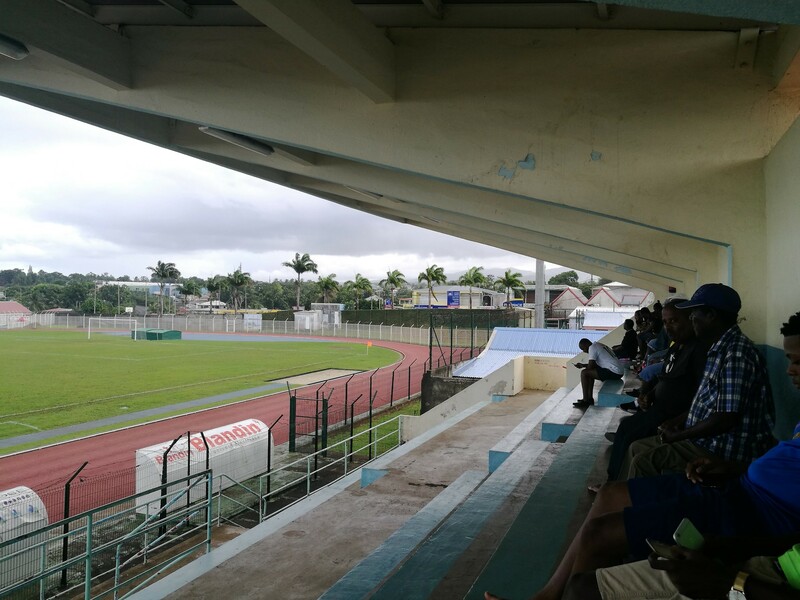 The home coach thought his charges had learnt a lot since their heavy defeats, and he was looking forward to the derby game when they would finish this tournament with a match against Saint Martin. Curiously, for two countries that share a small island, the record books only show one international meeting between the two parts. This was the first match on record for each (in 1988), and ended up with a 3-1 win for the French portion. As both have three defeats to their credit, it will be a game for local pride as neither expects (or even hopes) to escape the lowest division when the Nations League proper starts next season. Indeed, as I had discussed with the FA president earlier in the day, a few matches where they have a chance of winning in this lower division, hopefully coupled with a return to home matches may be the boost his team needs. The visiting coach was pleased by the win, and thought the sharpness of the few players who had been playing made the difference. He explained the change in formation, but we did not press him on whether it had worked. All this meant I had missed the shuttle minibus with most of the support, but I was taken to the ferry port with some of the officials and the equipment. 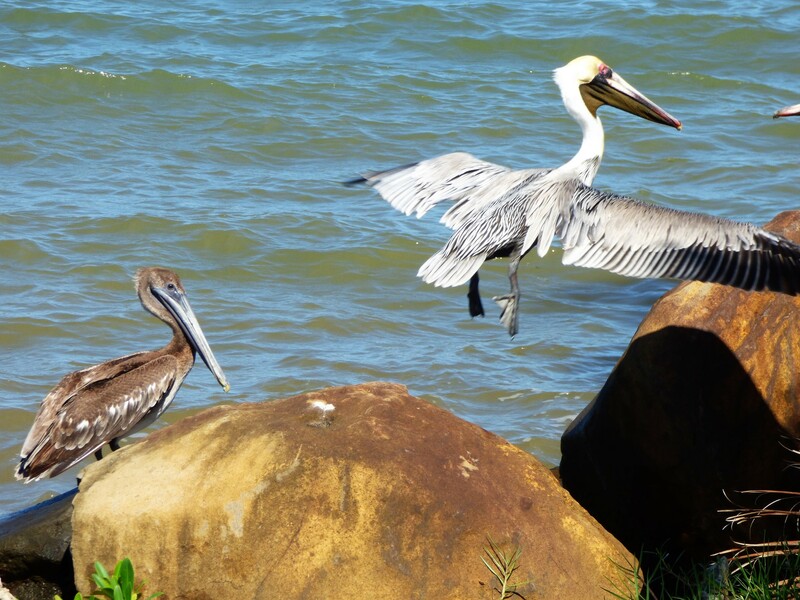 When we got there, all the spectators were still waiting for the ferries. Again, we have to go through the rigmarole of signing in, and then paying departure tax ($13) before getting on the boat. In fact, the whole group including the players and home officials are waiting for some time for the boats to get back off another shuttle trip. There are a small number of tourist day trippers who must have wondered what was going on, but we did not travel with them, as ours were chartered ferries. (Still the same type of boats). 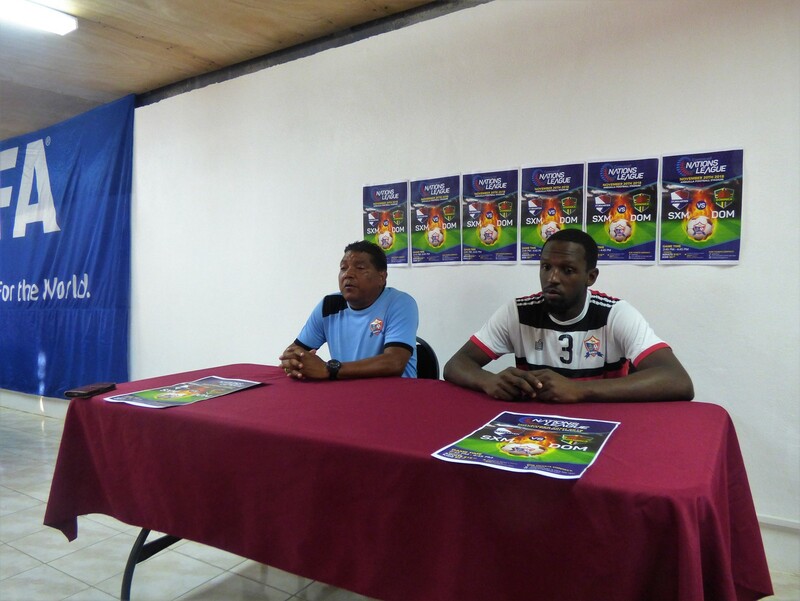 I did not see any of the Dominica fans or players, nor the CONCACAF officials. The Dominica players were waiting on a bus when I left the stadium. My guess is that any supporters travelling by ferry were off the island ahead of me, while the teams and officials either left by air, or stayed until the next day, (or even both). Once again, there was an excellent atmosphere on the ferry, and again this was refuelled by the rum punch. I got talking to a few of the fans, and then went out with them for a meal and a drink afterwards. One of this little group was actually the mother of Djai Essed, who actually joined us briefly. I got to find out how his weekend had been. He is studying in Amsterdam, so he flew out to the Islands on Saturday, trained with the team on Sunday and Monday, played on Tuesday and then was flying back via Paris on Wednesday. He does not expect to be back on the Island until the next game in March. The others did not have a football connection, and I doubt that they watch the game on a regular basis. Much of the talk was of the damage of the hurricane and how to they survived. Everyone had lost something, whether it was the contents of their apartment, to a yacht big enough to have been sailed to St. Martin from South Africa. Everyone on the table had been born in different countries, but all now (except me) are now settled on this island. 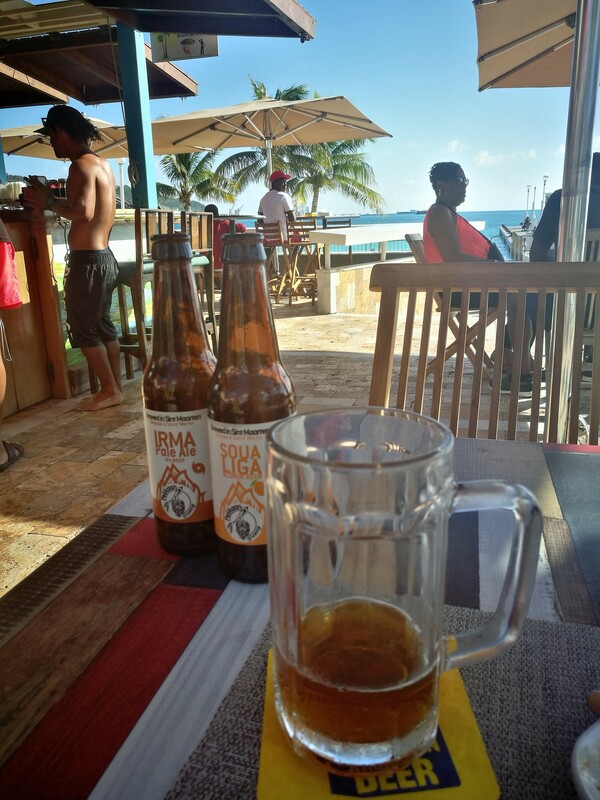 With such a high proportion of the population being employed in tourism, storms like Irma affect everyone as the first result is evacuation of tourists, and no quick return as the facilities have gone. Many people were without employment immediately. I think one of the advantages in not being independent from the European empires is that the governments in Europe do grind into action with aid and relief. After this, I settled on the island myself for the next week, settling into an apartment on a resort on the French side. I spent a short while on the famous beach by the airport on the morning after the game. Here the planes come in low over the beach, with the start of the runway immediately across the road from the beach. The biggest thing I saw land was a 737, but I noted that two wide bodied jets were due in during the afternoon. The cafes at each end of the beach write up the expected arrival times, while there are warning signs over the danger of jet blast. They are not joking, a Canadian tourist was killed last year as a result of injuries suffered when knocked over by the blast from a jet. I have been neglecting anyone who reads the blog, as recently I have found it easier to write some lengthy diatribes directly to facebook and then post these with pictures. 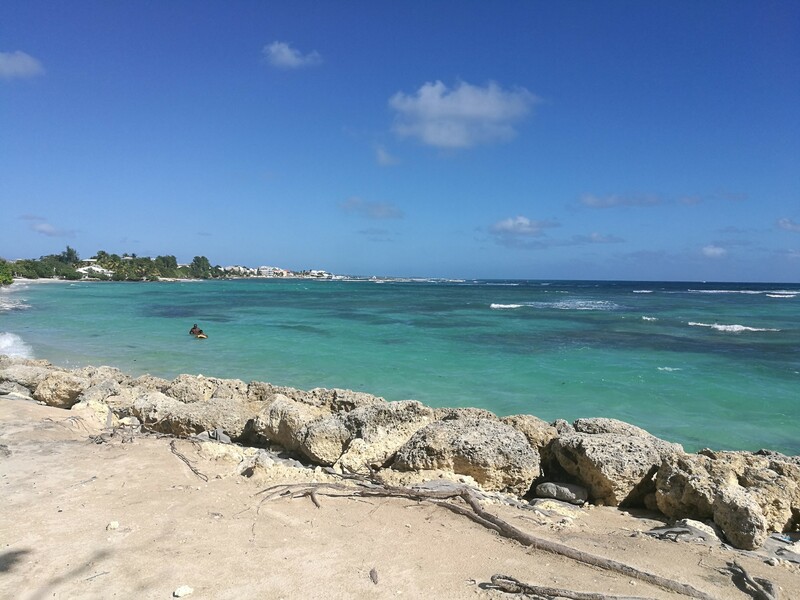 I am not going to repeat all of that here, but instead provide a quick sketch of the start of my Caribbean odyssey, and then links to the facebook posts where individual reports on each match day cane be found. Now, it is quite simple – the United Nations has 193 members, so there are 193 countries in the World. Simples? Not really – FIFA manages to up the numbers to 211, but somehow manages to miss a few out, while there are 11 extra football associations around the world that have full or associate membership of continental federations, but are not FIFA members. Then of course there are the self-governing territories that have not managed to achieve recognition of statehood, as some of the members of the UN are opposed to their existence. The other way of putting that is that at least one UN member state claims the territory as their own, but for some reason cannot govern it. In simplistic terms that is normally down to the military forces of at least one other UN member state. It should not be a surprise that there are more than a few cases where those military forces are Russian. Some of these are members of CONIFA, (particularly, but not exclusively the Russian sponsored states). Such states include Abkhazia, Nagorno-Karabakh and the Turkish Republic of Northern Cyprus. Kosovo is another territory that cannot get full membership of the UN, despite widespread recognition, but unlike those already mentioned, they have achieved membership of FIFA. All members of FIFA are also in membership of one of its six constituent Confederations, although as I have already mentioned, the reverse is not true. There are 11 football associations that have joined their confederation, but are not FIFA members. Generally, these may aspire to joining FIFA, but the rules have been changed and for the moment it appears the doors are closed. Only two of these 11 are fully self-governing, although all have some degree of autonomy. As parts of democratic states, they could choose to become independent at some time in the future, but they are choosing not to be. Six of the 11 are in the Caribbean, which is why I have brought up the subject here. 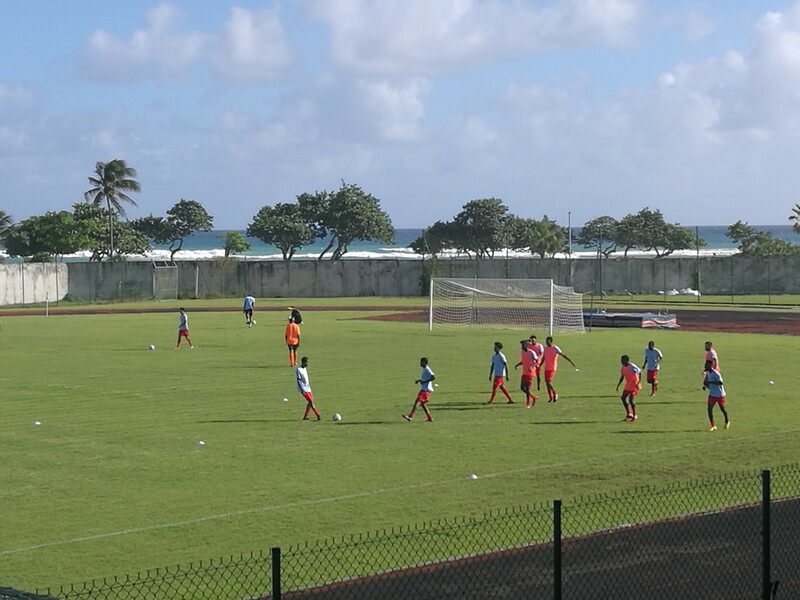 The eleven are French Guyana, Martinique, Guadeloupe, Saint Martin, Sint Maarten and Bonaire in CONCACAF, the Northern Mariana Islands in the Asian Football Confederation, Kiribati, Niue and Tuvalu in Oceania and Reunion in Africa. Of these eleven, only Kiribati and Tuvalu are fully recognised at the UN and therefore stand some chance of joining FIFA in the near future. Oceania could add another four members without controversy, if the countries so wished. The Marshall Islands, Micronesia, Nauru and Palau are all full members of the UN and therefore meet the first of the FIFA’s current requirements. There is one more full member of the UN, Monaco that has not attempted to join FIFA or any of the Confederations. This is because of uncertainty over the fate of AS Monaco in the French League should they go independent. Curiously, while AS Monaco plays within the principality and in the French League, all the games in Monaco’s domestic football competition are played on grounds in France. Over the years, FIFA has had a much easier entry criteria, which has allowed for many extra members that are not sovereign states. The tightening of the regulations was mainly in response to Gibraltar’s application for membership, which has heavily opposed by Spain. So much so that the two teams cannot meet in competition to this day. Indeed, the United Kingdom has more FIFA member states than any other country in the World. 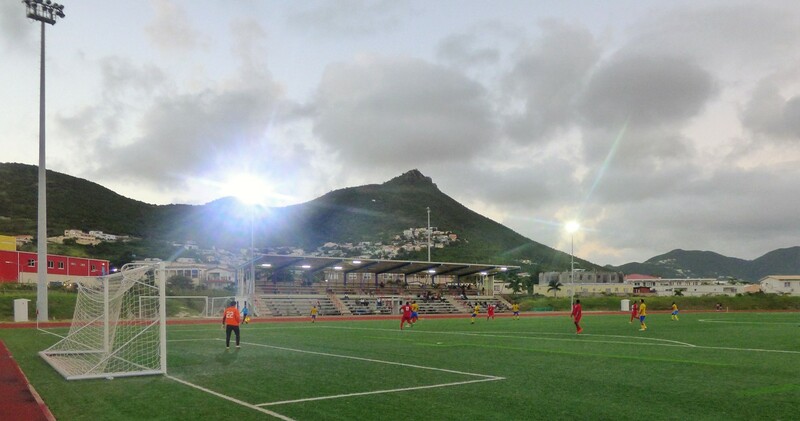 Apart from the obvious constituents of the UK (England, Wales, Northern Ireland and Scotland), and the newly entered Gibraltar, British dependent territories in the Caribbean are also in FIFA. None of Anguilla, Bermuda, British Virgin Islands, Cayman Islands, Monserrat or the Turks and Caicos Islands are members of the UN, meaning that the UK actually has eleven FIFA members. We are not alone, just the most prolific. Apart from its four associate members in the Caribbean, France has two full members of the Oceania Football Confederation and FIFA in French Polynesia (aka Tahiti) and New Caledonia. The latter has just voted not to become independent from France. The Netherlands has responsibility for the other CONCACAF members. Sint Maarten and Bonaire, plus also Aruba and Curacao which are full FIFA members. The USA includes two Caribbean FIFA members, Puerto Rico and the US Virgin Islands, as well as American Samoa (Oceania), and Guam (Asia) and the aforementioned Asian associate, the Northern Mariana Islands. The Faroe Islands are an autonomous region of Denmark, while the special administrative regions of Hong Kong and Macau are FIFA members, but also parts of China. China would like to claim Chinese Taipei (aka Taiwan) as well, and will complain vigorously if you miss the island off a map of China. Finally, Palestine has a special status at the UN and is a full member of the Asian Football Confederation and FIFA. As I keep a list of countries I have seen football in, I needed to be able to have my own definition – and I have gone for wide scope. My list of countries visited for football will include any with full or associate membership of any of the Confederations, or full membership of the UN. Hence of this trip, all my first stops, Guadeloupe, Martinique, Anguilla and Sint Maarten will count. I also count Monaco as I have seen them in the French league, but for my matches in Monaco’s Prince Rainier III competition, the venue is shown as in France. You are currently browsing the Football Shaped blog archives for November, 2018.